A reverse mortgage is a loan that is designed for home-owners 55 years of age and older (if you have a spouse, the age qualification applies to both of you). A reverse mortgage is secured by the equity in the home, which is the portion of the home’s value that is debt-free. It allows home-owners to obtain cash, without having to sell their home. Not all lenders offer reverse mortgages. 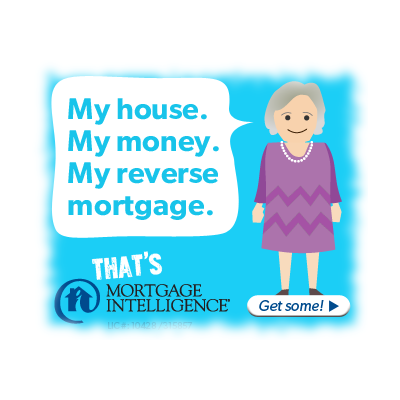 Unlike an ordinary mortgage, you don’t have to make any regular or lump sum payments on a reverse mortgage. Instead, the interest on your reverse mortgage accumulates, and the equity that you have in your home decreases with time. If you sell your house or your home is no longer your principal residence, you must repay the loan and any interest that has accumulated. The loan amount can be up to 55 percent of the current value of your house. However, you must pay off any outstanding loans that are secured by your home with the funds you receive from your reverse mortgage. – a combination of these options. The equity you hold in your home will decrease as the interest on your reverse mortgage accumulates over the years. – fees for independent legal advice. What if the home goes down in value? Repayment of the Reverse Mortgage is guaranteed not to exceed the fair market value of the home at the time it is sold. In the event that the fair market selling price of the home is not enough to repay the Reverse Mortgage in full, the repayment is limited to the amount received from the sale of the home. No other assets in the estate will be touched. If the proceeds from the sale of the home exceed the balance on the loan, the estate retains the surplus.